YOLA, Nigeria (AP) — A pair of explosions killed at least 28 worshippers at a mosque in northeastern Nigeria and wounded at least 56 others, with many of the victims caught in the second blast while trying to flee, police said Tuesday. The attack in Mubi town came a day after President Muhammadu Buhari met with U.S. President Donald Trump at the White House and discussed the threat from the Nigeria-based Boko Haram extremist group. Its fighters were quickly blamed for Tuesday's blasts. This is the second time in six months that dozens have been killed in an attack on a Mubi mosque. In November, a teenage suicide bomber attacked worshippers as they gathered for morning prayers, killing at least 50 people in one of the region's deadliest assaults in years. One resident, Isa Danladi, said he had been about to leave his house near the mosque when he heard the blast. The National Emergency Management Agency coordinator in Adamawa state, Imam Abbani Garki, said 18 people were critically wounded and had been evacuated for treatment in Yola city. Haruna Hamman Furo, the head of the state emergency management agency, called the attack "devastating." 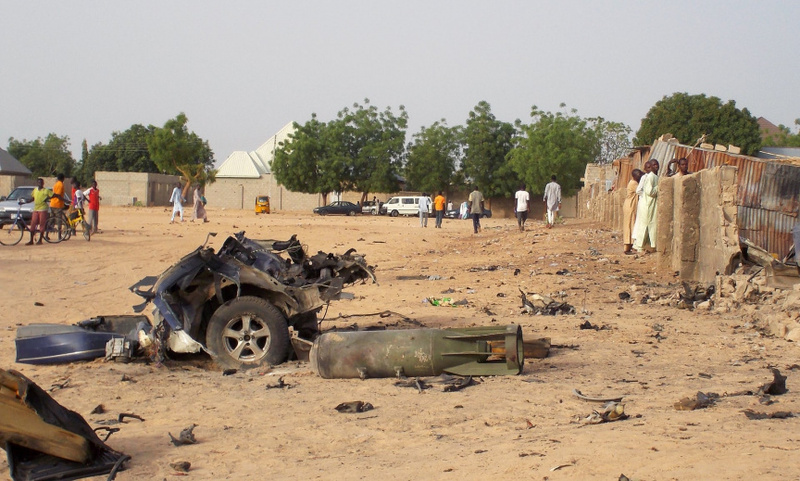 Boko Haram briefly took over Mubi in late 2014 as its fighters rampaged across northeastern Nigeria, seizing towns and villages in its quest to establish a hard-line Islamic state. In recent months, Boko Haram activity has been concentrated in the far north of Adamawa state, around Madagali, near the border with Borno state. That area is not far from the Sambisa Forest area where the extremists had a stronghold. Boko Haram fighters are also said to be hiding in the Mandara mountains to the east near Cameroon.